The clients wanted an art studio and guest house that would be separate from their main house. They were interested in incorporating rustic and reclaimed materials to create an aged feel to the building, in contrast with the more contemporary existing home. 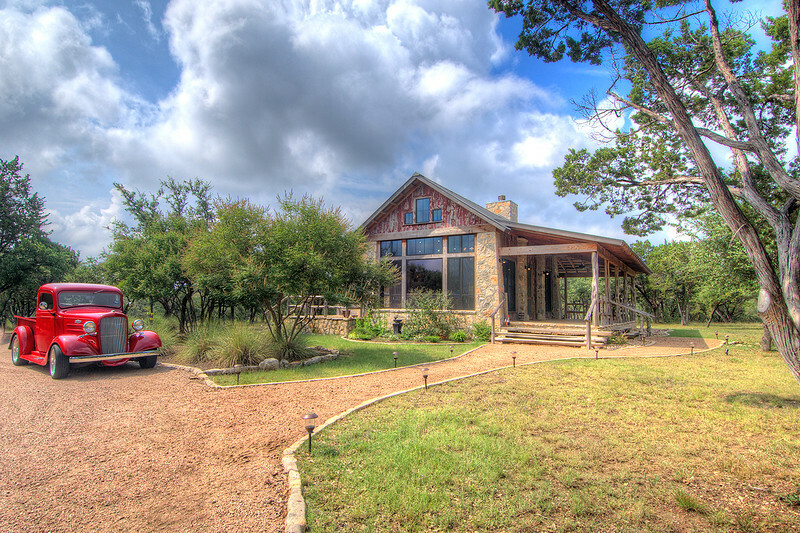 The ranch is west of Wimberley, Texas. The clients purchased the property along with an existing residence several years ago. The Art Studio sits to the south of the main house, fronting a shared circular drive. The site gently slopes northward, with views of the ranch toward the west. Our goal was to create a structure with the feel of an old ranch building - somewhat like a barn. The design was configured to look as if an old building was converted to a current use. The primary element is a gabled Great Room, with a low- sloping roof wrapping the east, south and west sides. The north wall of the Great Room contains large windows to capture northern light. The Great Room houses the art studio and a lounge area, with a fireplace and murphy bed. The eastern wing contains a bath, a kitchen and a storage room. Native limestone, reclaimed barn boards, fir planking with elastomeric chinking, stained concrete floors.